After its arena partnership with the Brooklyn Nets last season, the Philippines’ own Tanduay Rum widened its reach in the NBA by signing another historic deal as an official partner of the Golden State Warriors. The two-year deal, with an option for an extension, became official last Tuesday after the signing was held at the Tanduay Rum Club at the Oracle Arena, home of the Warriors, where Tanduay president Lucio Tan Jr. and Warriors chief marketing officer Chip Bowers were present. This is a first for a Philippine company to partner up with a reigning NBA champion franchise. 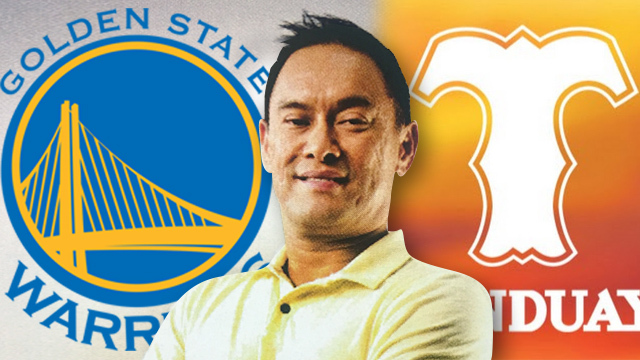 “Tanduay is proud, and as basketball fans, thrilled to be associated with the Golden State Warriors,” said Tan in a statement announcing the deal as posted on Tanduay’s social media accounts. As part of the deal, Tanduay will also be a presenting sponsor of the Warriors’ upcoming Filipino Heritage Night on October 29 as well as other games in the season. A variety of Tanduay signage will be integrated in Oracle Arena as well. With a large Filipino fan base, the Warriors saw the partnership deal with Tanduay as a perfect fit. “Of our 12 million Facebook followers, 44 percent of them are from the Philippines, so we love to be associated with the best of brand companies,” said Bowers in an interview with Balitang America.